This is a very haunting photograph. 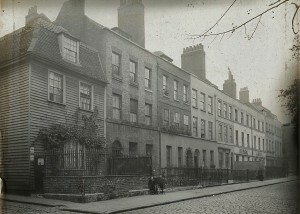 It shows the west side of Wellclose Square in 1910, just before the area was about to change radicallly. My family lived in the square from around 1880 until the 1914 when they moved to Hermit Road Canning Town. My Great Aunt ran a lodging house for sailors in Graces Alley (opposite Wiltons). My Great Uncle ran a pub called The Grapes which was in North East Passage running from Cable Street into the square, and my Grandmother ran a grocers shop on Dock Street (now Ensign Street I think). This area had it’s own Courthouse and Gaol and as well to being home to dock workers and sailors there were many merchants living here, mainly from Sweden and Denmark due to its close proximity to the London Docks.